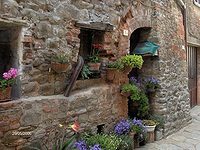 But in reality, there are no words to adequately capture the beauty of this little gem, with its splendid panoramic position and its unspoiled, medieval Tuscan village structure, set apart from the usual tourist circuit and the chaos of modern life. Rigomagno is a small village where everything is cared for with attention, where even today one can have an authentic Tuscan experience in the colours of its streets, in the rush of water in the old, village washing troughs, in the taste of its oil, which is of such renown that Rigomagno is also known as the “Hill of Olives”, or of its “ciambellino”, a traditional sweet that’s celebrated in the “Village Festival of the Ciambellino” and that is strictly homemade by the village women, who pass the recipe on from generation to generation. and other, more ancient sounds, virtually lost today... .such as the tolling of village bells that still signal the passing of time.